I hate staking. I'll happily weed for hours on end, happy as can be. I'll spend a full day working hard with a shovel and smile all the while. But I hate staking. Because of this, my tomatoes always end up sprawling in a tangled mess on the ground. I know they'll be healthier if I stake. I know it will be easier to harvest them if I stake. Because I know this, some years I actually go so far as to put stakes out in the garden, which resulted in my tomatoes being a wild mess with some stakes sticking out of the middle. So this year, I'm going to try growing some determinate tomatoes. 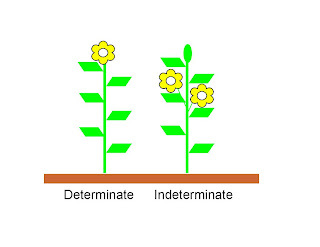 The technical definitions of determinate and indeterminate just refer to where flowers are produced. Determinate plants produce them at the top of a stem, forcing new growth to come from new branches at the side of the plant, while indeterminate plants produce flowers along the sides of the stem, allowing a single branch to keep growing on and on and on. This means that determinate tomatoes grow short and bushy -- rarely needing to be staked -- while indeterminate tomatoes grow long and floppy -- and theoretically ought to be staked, though of course I never actually do. I've steered away from indeterminate tomatoes up until now, though, because catalogs always define them a different way: They say the determinate tomatoes produce fruit which ripens all at once, while indeterminate varieties produce continuously all summer long. But: Recently I've been reading something different: Tom Clothier on the tomato page of his quirky, very enjoyable website, says some there are determinate tomatoes, which produce a load of fruit and then stop, and there are vigorous or strong determinates, which keep sending up new shoots, ending in flowers and fruit, all season -- so they produce continously like a indeterminate, but minus the staking, and are usually much earlier than indeterminates. We'll see how they perform! Anyone with experience with determinate tomatoes? If so, please leave a comment with your thoughts, and any varieties you'd suggest or warn against. Hi Joseph. I wondered what determinate and indeterminate meant on the tomato inscriptions. Thanks for clearing that up. I have been trying to decide what tomatoes to grow this summer also.I may just go with Celebrity or Big Boy. I tried Brandywine's last summer and that was a fiasco for planters. Talk about your tangles mess.I just did not like the taste either and since it was suppose to be an old heirloom favorite I was really let down by its flavor. Hi, Joseph. It's my first time visiting your blog, and I like what I've seen thus far. Oh, and it produced all summer long. There was a moment where it set most of its fruit, but then we kept getting a few tomatoes here and there, right up through September. Good luck with your summer experiment! I think you really have to try bunches to find out what you like -- I enjoy Brandywine, but it isn't my favorite (and yes, it is a tangled mess to beat all tangled messes!) My standard favorites are: Matt's Wild Cherry, Black Krim, Olpaka, and Prudens Purple. Welcome Meredith! And thanks for the comment... I'd better not have to stake the darn things! We'll see! FYI to all of you tomato growers... I found a terrific support tool called the Tomato stake. Better than everything else on the market, and outlasts metal cages, bamboo, etc.